Jor-El Caraballo, author of the blog Mane Man, shares his unique experience as an outspoken man in the natural hair community, a forum that is dominated by women. How would you describe your relationship to your hair? Does it play a significant role in your view of yourself? I would describe my relationship to my hair as a pretty protective one. It’s always been a fairly big part of my identity in terms of acknowledging my heritage and I’ve always taken pride in my hair, but it wasn’t until a few years ago that I had the courage to try something new and let it grow out. Since growing my fro, I’ve noticed I’m even more protective of it and I spend a fair amount of time thinking about styling it or making it look and feel healthier. From what you’ve written on your blog and in other interviews, it sounds like the reactions to your longer hairstyle have been mixed. Have you noticed any patterns in the reactions (e.g. more positive comments from younger people, more negative comments from women or men)? I would definitely say that I’ve gotten mixed reactions from my fro over the past few years. In the fro’s early days women of color, black women in particular, would sometimes ask me if it was “real” or not, which I found to be a really interesting experience. It had never occurred to me that my hair might not look “real”! As I was exposed to the curly haired and natural hair communities, I feel a lot of women embraced my hair and how I align myself with the community, which is pretty cool. I think that women who have straighter hair textures often find themselves fascinated with my crown so it’s always a conversation piece. With men, I think a lot of guys in the professional sector don’t get or respect what it symbolizes for me which is pride in my heritage. Socially, I would have to say that white guys are by far the most intrigued about my hair over any other group which has been a pretty unexpected experience. Unfortunately, sometimes there have been incidents when people would just dive their hands into my mane which led me to invent a Duck & Swipe move to reclaim my personal space. Having a fro is certainly an interesting social experiment at times! There is a lot of information on the web surrounding the transition from relaxed to natural, caring for curly hair, styling curly hair, etc., but most of that content is by women for women. Do you feel that the needs and perspective of men who have curly, natural hair are overlooked? Honestly, I do feel like men are overlooked in the natural hair and curly haired sectors but I don’t really fault anyone for it. I think that men have just been historically overlooked when it comes to hair care and need more education on how to maintain a mane that fits their personal sense of style, personality and is healthy. I don’t knock the communities for not having male-oriented content because that’s where I received most my hair education over the years (from women). I think it’s unfortunate that a lot of guys don’t grow up with dads or other male figures who knew (or even cared) about grooming the way we do now. But I think there’s a huge shift happening in men’s grooming and that’s why I created MANE MAN, so that I could be a part of that. How has ‘going public’ via your blog and social media avatars changed the way you feel about your hair? I don’t think that my going public with my hair has made any significant impact on how I feel about my hair, although I think dealing with both the criticism and praise has helped me evaluate and validate my decision to embrace the fro. Do you feel that your hair has shaped how others perceive and interact with you as a person, both now that your hair is longer and when you wore it close-cropped? Definitely! I feel people definitely get the sense that I see myself as “different” or not as conventional as they thought I was when I sported a cropped mane. That has both its benefits and challenges; sometimes people think I use drugs or that I am somehow juvenile or unprofessional. But I personally feel who I am is conveyed through so many facets like my dress, my speech, and my personality. It all works together to show who I really am. How did you feel about your hair when you were growing up? Was there a particular moment (or moments) when you recall your perception of your hair and yourself changing? I always liked my hair growing up, but as a young person I also wanted to try something new with it. There were times when I wanted a mohawk, there were times when I wanted to dye it and all that, but I never really switched it up. However, I do think it’s healthy to do that when you’re young so you figure out what you really like and if that matches how you see yourself. 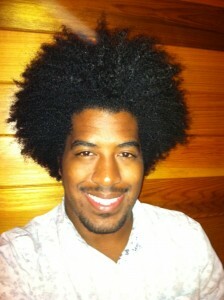 I used to get a lot of positive feedback about my hair texture being “good hair” but I never really believed the hype. Rocking a fro and embracing my texture, for me, really challenges that perception and aesthetic of what’s “good” enough or worthy of praise. I can say that I really love my hair and how it reflects who I am. Do you feel that your decision to embrace your natural texture has changed your sense of style or made you more bold or adventurous in your clothing selection? Absolutely! I can’t tell you how much my style has changed over the past few years since I started to grow my fro. I tell people all the time, I literally had two favorite colors in middle school: gray and light blue. While I do still really like those colors, I realized that part of my obsession with them was to not stand out too much because I don’t think I was comfortable with getting attention. I’m still not a huge fan of being the center of attention but I am infinitely more comfortable taking risks with colors and patterns that I would have run away from years ago. I happen to love wearing purple and sometimes pink because I think they look great with my skin tone! What do you love most about your hair? The thing I love most about my hair is also the thing I used to hate most about it; my texture(s). As a man with limited knowledge about hair care, seeing my natural texture(s) and learning how to deal with them for the first time was a challenge. Sometimes I just have to laugh off how ridiculous it is trying to make it (my fro) look uniform. I love my fro’s uniqueness. What issues (if any) do you continue to grapple with when it comes to your hair as it relates to your overall appearance and sense of self? The only real issue I have with my hair is that sections don’t grow evenly. But I guess that’s hair, right? I just wish I could avoid getting trims all together and that my fro would magically be equal and even all around with no maintenance. What are your favorite Original Moxie products? I have to say that Lux Locks is awesome. It’s a great styling product for me as it provides a lot of moisture and it penetrates my hair shaft leaving it feeling soft no matter how clean, or unclean, my hair happens to be at the time. I love that stuff!